Ahhh, Sunday mornings, no feeling of rush or perception of time. Just the whole day ahead of you to do whatever you please. I always begin my Sundays by turning on the TV program, “Sunday Morning” at 9am. This was a tradition with my dad and I that I have continued on my own. There’s nothing like the familiarity of Charles Osgoode’s soothing voice talking about the rural farmer-turned toilet seat artist. After sipping on my coffee, that’s when I begin breakfast. Whether it be scones, quiche, or lox, Sunday breakfasts are always something I look forward to. With the weather turning from fall to winter, it seemed appropriate to cook up something comforting. The idea for a bacon, leek, and mushroom quiche came from the flavour combination of potato leek soup. 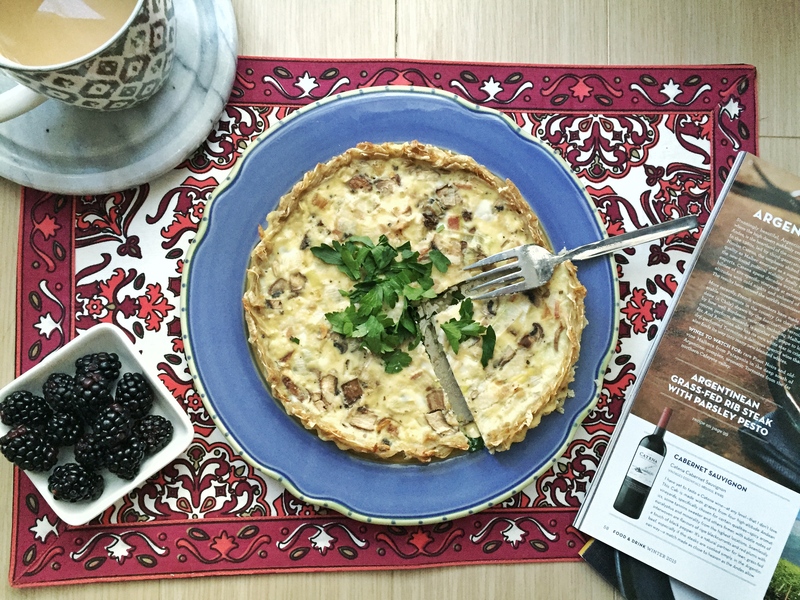 This is a fall classic, so why not bring that to the breakfast table? Keep reading for the recipe. See recipe for potato crust here. Re-heat oven to 350 F.
Begin the crust by shredding the potatoes into a bowl. Transfer to a tea towel and squeeze as much water out as you can. Place again in bowl, and add flour, egg, and spices. Mix thoroughly until combined. Press potato mixture into a greased 8 inch tart pan until no gabs are visible.Make sure the potato comes up to the very edge so you can fill it with as much egg as possible later. Bake crust for 15 minutes at 350 F, until slightly browned. Meanwhile, prepare the filling. First, heat a large skillet over medium-high heat and add sliced bacon. After rendering some of the fat (2 – 3 minutes), add leeks. Brown for an additional 2 – 3 minutes before adding the mushrooms. Whisk together 4 eggs, and add cream. Then, add sauteed bacon mix to the eggs. Remove crust from the oven, and fill with egg mixture. Leave just a fine layer of potato showing over the edges of the eggs. They will expand in the oven, so you don’t want the mixture to overflow. Bake again at 350 F for 30 – 35 minutes, until eggs have set.